Je L'ai Dit: Introducing Way2Droid - Way2SMS for Android ! Awe-Fcuking-some.. Can i get one for iphone. I swear i have been ideating on one such app since ages. And, contradicting popular belief, ppl using iphone are also money conscious and want to / not to spend on SMS. Pls can u make one for iphone OS4. My Tw handle is @OyeBehenDeTakke. Oh man,this is bloody awesome,excellent work.. Awesome, much better than many other way 2 sms programs. I'm suggesting some features which you can think of including in the next version. All the best keep up the good work. 1. auto clear option after the msg is successfully send. 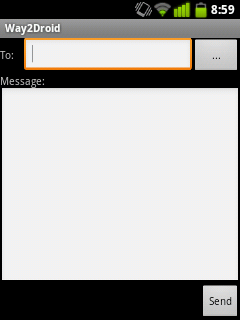 2.Option to send msg to multiple contacts. 4. After picking the address through speed dial Address bar to show up the complete phone number once in text editing mode so as to be sure of the address before sending. 6. Relocate the send button so that it is not covered by the keyboard in portrait mode. 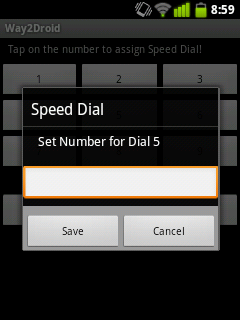 I have already been working on few of the features you mentioned (drop down for contacts, speed dial to show up number). I am currently stuck with some other priorities and hence not able to put time on this. If you are a fellow android developer too, then i'd be more than glad to add you as a committer in the project (as you may be aware its open sourced and hosted in google code). Please let me know! can I use your hosted API in my Android application Free SMS Sender? I have been asked by my users to implement way2sms.com so I did, but now I found you have php based API which could make the sending faster and take less mobile data. You really don't know how much I am thankful to you. This is an Awesome app for me to send smses to my friends in India. 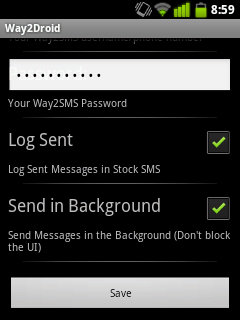 Moreover the log to sent items is as if its real (sms) sent items. There are always room for improvement but that doesn't really matter when the usefulness is concerned. One word - Awesome and 5 star. Hey,i used above script.Really cool.You can use it to create your own android,iphone apps..
Why not use the reliable API's available at ubaid.tk ? The API's are now used by developers of all platforms, let it be iOS , android or Windows Phone. These API's work the same way, whether you use it in your website, or your mobile app. The API is now sending more than 2 Million SMS per month, and is up from more than a year now. Give it a try, i'm sure it wont let you down! hey i have downloaded.apk of this application,but when i try to run it,there is one message like "Overrite existing custom game/service files?"